You’ve probably already done it, but in case you haven’t do not look at the hidden family tree map that is on the inside of the “Clockwork Princess” sleeve. If you do, it will spoil the book for you a little bit. “Clockwork Princess” by Cassandra Clare. Oh My Goodness. Did that really just happen?! I was completely freaking out reading this novel. So many questions are answered for both “The Infernal Devices” series and “The Immortal Instruments” series. All the connections have been made. Now I just want Tessa to be introduced to her present day family. Does that make me selfish? I would love them to be able to meet her, I understand the difficulties of watching the people that you love die but it would be so cool. I think the younger generations would love Tessa and want to learn about everything she has seen since she has lived for so long. “Clockwork Princess” was not my favorite novel out of the trilogy, I’ve heard a lot that this was the best one and I still prefer “Clockwork Prince” out of the three. “Clockwork Princess” is by far better than “Clockwork Angel.” I absolutely loved “The Infernal Devices” trilogy. 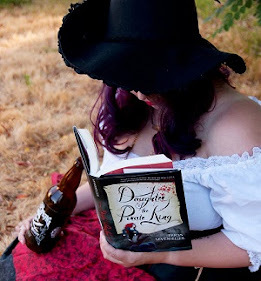 I loved the characters and I loved getting to know about Henry and the devices that he made, which are used in “The Immortal Instruments” series. This series gives you so much background information along with being its own separate adventure. I love it. Sorry if I am going all book nerd on my readers, I just can’t get enough of Cassandra Clare’s writing. She is a fantastic author. Tessa has grown up a lot since the last book. She has to deal with her feelings for Jem and for Will since she is engaged to Jem after all; she can’t act on both feelings because it wouldn’t be proper. Tessa is learning all she can to be a strong fighter and a good wife. What Tessa doesn’t plan for is the more she tries to move forward with Jem, the more she thinks about Will. On top of everything else, Tessa has to deal with the fact that Jem is getting worse and he may not live as long as they thought he would. “Clockwork Princess” is completely focused around Tessa this time. Of course, like every other Cassandra Clare novel, there are plenty of twists and turns to keep you occupied. “Clockwork Princess” was very well written and it was such a nice wrap up to “The Infernal Devices” trilogy. I was very happy with the ending and was pleasantly surprised by the epilogue which I loved the most. Way to go Cassandra Clare for surprising your readers. When all of the pieces began to click and connect in “Clockwork Princess” I felt all warm and fuzzy inside. When things click you can’t help but feel good. This book is completely about “the feels.” I honestly think some of the information that was included in “Clockwork Princess” was specifically for the fans. I think the “Clockwork Princess” cover is the best cover out of all three. It is gorgeous and beautiful and dazzling! I am sad to see this trilogy ending, but I am so happy with the ending that I am okay with it being over. Besides I hope this isn’t the last time the readers see Tessa Gray. Cassandra Clare did a great job with her final novel in “The Infernal Devices” trilogy. 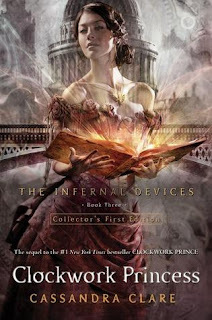 If you haven’t read any of “The Infernal Devices,” check out “Clockwork Angel,” which is the first book in the series. You won’t regret it. I give "Clockwork Princess" four out of five bookshelves.